"Mike Kronmiller Kathmandu, Nepal: Day 6 went really well! I had an opportunity to work with the students for 3 more hours which allowed me to teach them about calibrating the drone and safety. I'm really impressed that they were able to build a drone in 6 hours and they are very excited to teach more of their peers about construction, operation, and safety. Now that they have completed a drone I plan to teach them about utilizing drone websites to learn about more applications of drone, beyond search and rescue, and allow them to pursue their own ideas." 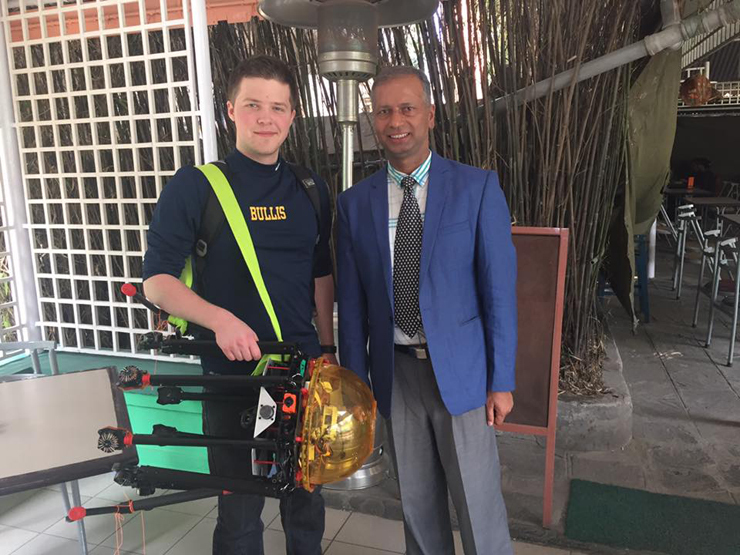 "Mike Kronmiller, Kathmandu, Nepal: Day 5 was a was extremely fun! I had the opportunity to present to my youngest audience, 8 year old 3rd graders. While presenting at Kanjirowa, the head of a primary school in Kathmandu offered to let me take about drones to 3rd, 4th, 5th, and 6th graders. I happily accepted and had a wonderful time taking to the students about drones. 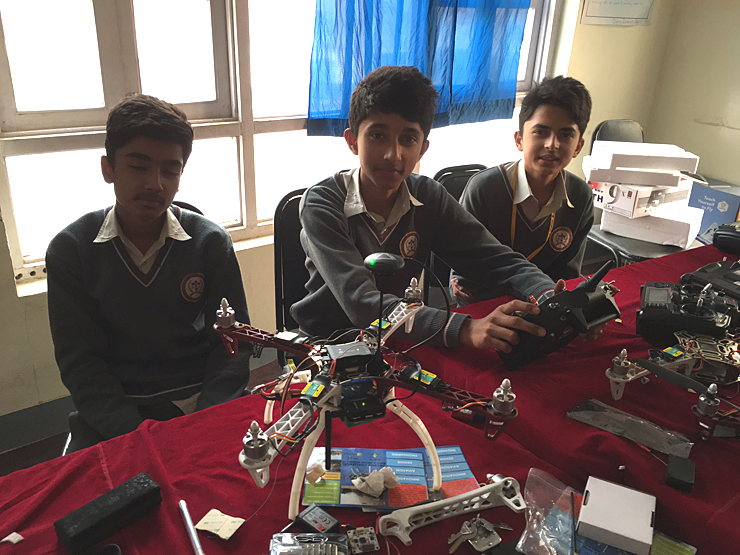 The asked great questions about the applications of drones and how they can begin learning about them." "Yesterday I had time to work individually with the students, teaching them about the hardware in their kits and also giving them the curriculum powerpoint. I look forward to work more closely with them on Wednesday on the software. Later I went to Ihub, a library funded by the US embassy an talked with students from other schools about drone technology. Many of the students were so excited they wanted to work with the students at Kanjirowa." "Novolazarevskya Station, Antarctica: We spent the day packing gear onto the sled that will be towed by the Everest tracked vehicle across the ice to Lake Untersee. We made pretty good progress today and we plan to begin the 125 km traverse early tomorrow morning. Hopefully we will be at Lake Untersee by about 2pm UTC. For the moment we are still enjoying nice weather with clear skies, warm temperatures and little wind and if we are lucky this will be the case when we head to the lake tomorrow. Once at Lake Untersee we will beging putting up tents so if the weather becomes inclement we will have refuge from wind and blowing snow." "14 Nov 2015 11:00 am ET: The weather went down a bit and they could not keep up with the conditions to clear the ice-runway of snow. You can see in the webcam image taken just a short while ago that they are continuing to clear the snow. My guess is that the Baslers (DC3s) will arrive tomorrow, and they need to be in place before our flight arrives to transport passengers to other stations." "8 Nov 2015 10:30 pm ET: The image below, taken a little earlier, is from the webcam at Novo Station's ice runway. The guys in the radio shack sent me a note a short while ago letting me know they had blowing snow and a few wind gusts hitting 42 m/s (94 mph) today." "7 Nov 2015 7:20 pm ET: My research team and I are now in Cape Town, SA awaiting our flight to Novolazarevskaya Station in Antarctica. The first flight made it down but its return to Cape Town was delayed for a day due to less than good weather at Novo that kicked up just before they were to depart." "On 24 April 2015 a 7.9 magnitude earthquake struck Nepal - a nation woefully unprepared to respond to such an event. Nearly 300 aftershocks of magnitude 4.0 or greater have rattled the country for the past month. One especially large aftershock of magnitude 7.4 on 12 May caused the already-shattered infrastructure to collapse further. Nepal needed help - help that did not rely upon a non-functional infrastructure. Much of the help was traditional. But some of that help arrived in the form of assets in space and space-derived assets on the ground." Dale Andersen is helping organize Space College. He is currently in Antarctica at Lake Undersee doing astrobiology research. You can read more about Dale here. You can read his previous status reports here and below. On The Road to Lake Untersee: We are completely packed up now, using the Everest tracked vehicle, pulling two sleds behind it. The first sled has most of our gear, the second has fuel additional cargo, and a cabin in which three of our team will make the traverse. Klemens, Vladimir and Allyson will ride out on the sled, Yukiko, Wayne and I will will drive the snowmobiles. Packing was a bit of a challenge since we had a little more science gear this year, but once both sleds were brought down, it all worked out perfectly with room to spare. I will send some pics later when I get back, and maybe after we get settled in at Untersee, I will try to upload a small one via the Iridium. Continue reading Astrobiologist Dale Andersen's Field Reports: Lake Untersee, Antarctica.